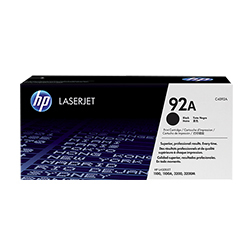 HP LJ 1000/1100A Ultra Precise Toner Cartridge (C4092A) : Disk-O-Tape, Inc.
HP 92A Black LaserJet Toner Cartridge with Ultraprecise technology for the HP LaserJet 1100 and 3200 Printer series. High-quality printouts for less than the price of most copiers. Designed to work precisely with HP LaserJet 1100 and 3200 Printer series. Features Ultraprecise toner particles for optimal printing of text and graphics. Page yield (black and white) Average cartridge yields 2500 standard pages. Declared yield value in acordance with ISO/IEC 19752.